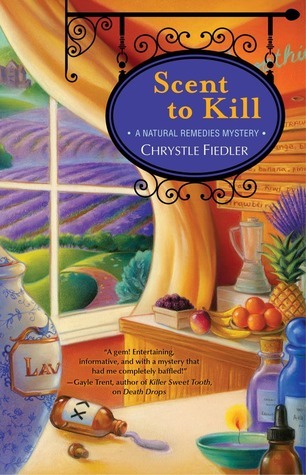 Scent to Kill is an interesting read and a puzzling mystery. The story is an intoxicating blend of information, a detective tale, and a sweet blooming romance. Naturopathic doctor Willow McQuade is still healing from the loss of her aunt Claire and settling in to life while running the Nature’s Way Market and Café as Scent to Kill begins. Willow’s ex-boyfriend, Simon, is part of the crew of a reality TV show filming at a nearby estate rumored to be haunted. Before filming begins, the cast and crew is having a party at the estate. Willow and her boyfriend, Jackson Spade, are attending, mainly in order to take advantage of the opportunity to tour the estate’s private lavender farm. All too soon, however, Jackson’s breaking up a fight and the night ends in murder. Simon, the primary suspect, begs Willow to help prove his innocence and, much to Jackson’s dismay, Willow agrees. The text is punctuated with tips for using herbal remedies and essential oils, something that I have really come to enjoy in Chrystle Fiedler’s fiction. The mystery stretches back to the Prohibition and reaches beyond the boundaries of reality with the psychic, MJ, attempting to reach beyond the veil and contact the spirits lingering in the Bixby mansion. Overall, quite an enjoyable read – one you don’t want to miss!